NO To NEW TRIDENT - For LOVE & For LIFE: New Trident's role in Asia-Pacific Pivot??? The Obama Administration continues to doggedly pursue the Trans-Pacific Partnership, which would stretch from Chile to Japan and - Ooops! - exclude China. China, of course, has its own ideas about trade partnerships at this stage in the game, and is pursuing its own agenda. "Obama had hoped his foreign policy “pivot” toward Asia would shift U.S. government attention away from trouble spots like Afghanistan and Iraq and toward a region brimming with economic opportunities." His strategy for exploiting "economic opportunities" seems to be the old school methodology - shift as many military assets into the region (can you say gunboat diplomacy???) as possible and see how it plays out. The article below, which touts the need for expanding the capabilities ($$$$$$$) of the shipyard that will build the next generation ballistic missile submarines (as well as more tactical subs) for the United States, makes it crystal clear that all of this is about the "U.S. foreign policy's pivot to Asia." The article also makes it clear that it's also about "the ability to project power from the sea." One might well ask what ballistic missile submarines bristling with enough thermonuclear weaponry (just one Trident submarine) to incinerate and render uninhabitable an entire region has to do with any reasonable strategy for sensibly engaging economic opportunities in Asia (or elsewhere). Should the US should be thinking more about how to deal with its future resource needs in a way that precludes (dangerous and risky) gunboat diplomacy? Do nuclear weapons have any rational place in any part of the Asia-Pacific Pivot (or anywhere else for that matter). 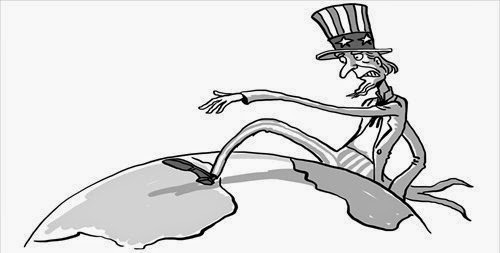 For now, these critical questions will not be asked while we continue the march to the (East China) Sea. GROTON — The head of Electric Boat said Thursday that revived demand for nuclear submarines as part of the U.S. foreign policy's pivot to Asia will result in $500 million being spent over the next decade to upgrade the company's shipyard here. "The Department of Defense strategy tends to favor the Navy and the ability to project power from the sea," said Electric Boat President Jeffrey S. Geiger. Considering that strategy, and the need to replace an aging fleet of the Navy's tactical submarines, the submarine program should prevail over the challenges of a shrinking military budget and the possibility of additional forced budget cuts that could reappear in 2016, Geiger said. To handle the coming work, Electric Boat plans to spend hundreds of millions of dollars on facilities and machinery. The largest chunk would pay for an expansion of the company's assembly building, which currently fits just one submarine at a time. With Electric Boat, a division of General Dynamics, expecting to begin construction of new Ohio Class replacement submarines in 2019, the Groton assembly building will need room to piece together one Ohio Class submarine and one Virginia Class submarine. Geiger expects that the replacement Ohio Class program will reach $100 billion, and given that Electric Boat has led its early-stage design, hopes the company would land the contract to build the submarines. But the Pentagon has given few hints at how it would award contracts. "Whether this is going to be a competition, we don't know," Geiger said. U.S. Rep. Joe Courtney said there is a dire need to replace the Ohio Class fleet. Their nuclear reactors were originally planned to run 30 years but have been extended to 42 years. If all goes as planned, Electric Boat expects it will need another thousand workers by 2030 at its Groton and New London locations; the two now employ about 9,000. Payroll for the whole company would jump to 18,000 from its current 12,500, Geiger said. Electric Boat has placed a bid to pick up submarine maintenance work that the U.S. military's backlogged shipyards need covered. Winning that bid could add as many as 600 jobs, according to a company presentation.